And that is exactly how it feels; epic and like nothing we’ve experienced before because we haven’t, not at this level. This seems to be in the air now and hurricane Irma is shaping up to be a record breaker also. There’s going to be more of this type of thing playing out now at this point within the Ascension and Embodiment Processes. No fear, just greater changes for everyone. 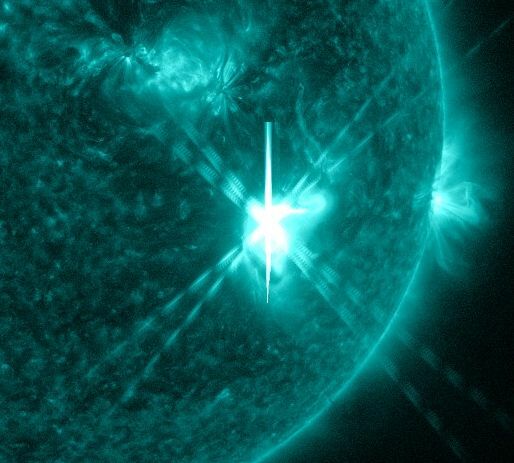 MAJOR X-CLASS SOLAR FLARE: On Sept. 6th at 1202 UT, sunspot AR2673 unleashed a major X9.3-class solar flare–the strongest solar flare in more than a decade. X-rays and UV radiation from the blast ionized the top of Earth’s atmosphere, causing a strong shortwave radio blackout over Europe, Africa and the Atlantic Ocean: blackout map. The explosion also produced a CME, shown here in a movie from NASA’s STEREO-A spacecraft. (The fast moving star-like object in the STEREO-A movie is the planet Mercury.) NOAA analysts are still modeling the trajectory of the CME to determine whether or not it is Earth-directed. Many readers are asking about the historic context of this event. How epic is it? Answer: This is a decade-class flare. A list of the most powerful solar flares recorded since 1976 ranks today’s flare at #14, tied with a similar explosion in 1990. Compared to the iconic Carrington Event of 1859, or even the more recent Halloween storms of 2003, this event is relatively mild. Modern power grids, telecommunications, and other sun sensitive technologies should weather the storm with little difficulty. On the other hand, sky watchers could see some fantastic auroras before the week is over. And ham radio operators will surely be noticing strange propagation effects as the sun exerts its influence on our planet’s ionosphere.Stay tuned for updates. There was an explosive energy blast (aka ‘Gateway’) that instantly catapulted many of us into NEW higher levels of being and awareness the first week of June 2017. I’ve experienced these instant explosion-like energy blasts before but nothing like what happened about a week ago now. This energy blast was different and very tangible physically; there’s no doubt whatsoever that things have shifted upward like they never have or could before last week, and it feels extraordinarily good. More about that in a moment. I’ve had trouble accurately in my opinion, understanding what some Ascension Teachers have meant when they used the term ‘Gateway’. I knew what they meant by the term, but not deeply and directly like I wanted. Over time and repeated encounters with them however, I’ve come to understand them in my own way which is typically visual. I’ve had trouble with words all my life because I come from a place—as all of us do—where words aren’t used because they’re not needed. Visual images, geometric shapes, coded Light patterns, amazing colors and complex patterns of different colored Light are words (pages and pages of them usually) for many of the higher awareness folks. One of my favorite toys as a child was a cheap little kaleidoscope I got as a gift one Christmas. I’d stare into that thing, marveling over every new colorful complex pattern that manifested with the slightest turn of its front end cap. It was beautiful magic to me and those kaleidoscope images reminded me as a child of something very important and otherworldly. A couple years ago I asked my Higher Self to help me accurately understand what ‘Gateways’ were and what I received were complex and beautiful visual images of different kaleidoscopic-like encoded Light patterns, each one wildly different in colors and patterns from the last one. As I watched these many kaleidoscope looking patterns and colors in my higher vision and awareness, I was simultaneously shown common physical combination locks with each different kaleidoscope image. These two visual messages informed me that the kaleidoscope-like images were what some others were calling ‘Gateways’ and that each one of them was very different and activated different things and DNA etc. within Forerunners, ‘Gatekeepers’, Gridholders, Pathpavers, NEW Energy Embodiers etc. These activation’s would happen and then we’d have to align with these NEW energies in and through our physical bodies. These ‘Gateways’ aren’t like the energy ‘Waves’ of past years that would come in, hit hard, then reside and give us linear time to acclimate to what had just happened. Stair-steps, energy stair-steps. These kaleidoscope-looking ‘Gateways’ (over the past three years about) are now ongoing energy alignments we have to make to and with because they’re not Stair-steps like before. They’re here, we encounter them one after another and must align our bodies with each of them (ongoing Embodiment and more) and this is happening faster in 2017 than ever before. Each kaleidoscope-like Gateway we experience now dials up (aligns) another section of numbers on a huge evolutionary Ascension Process combination lock that brings everyone another step closer to the mass global human collective “Shift”. View these kaleidoscope images below but think/feel each of them as different energy ‘Gateways’ we Forerunners encounter, align with and are individually altered by. When enough of us do this then all of humanity (ready to do this I mean) will automatically Shift into the NEW higher frequency Earth and level of being and reality too. Think of these images below as numbers on an evolutionary combination lock, and as the Forerunners move through each Gateway, another set of numbers in that great lock is dialed into alignment now and fully in the physical level because they have aligned with and Embodied more within their physical bodies. Also think of each kaleidoscope-like Gateway as another big step into the NEW Earth world reality and all that goes with that, and simultaneously another end to and of the old lower patriarchal negative world and reality and all that went with it. These two aspects are one actually, and the more the Forerunners do within themselves, the more and more quickly the old lower negative world disintegrates. Around June 6th and 7th I began feeling an energy explosion that propelled me into another higher level, space and state of being, which is the point of every one of these kaleidoscope looking Gateways. But as I said before, this one was different and far more potent than all earlier ones and it instantly blasted me out of where I had been and into a higher frequency space and state altogether. This repeated alignment process is only going to increase and quicken throughout 2017, so know that you will instantly change with every Divine change ‘Gateway’ and alignment with it. The time of trying to be or remain or pretend or convince ourselves (the Forerunners specifically I mean) that we’re human and can do what other humans do is long gone so just stop trying and dive into what’s happening now with your whole heart and soul. For a lot of decades this life has been about flying under the TD, global patriarchal radar long enough to survive and fulfill my Soul Contracted Volunteer Mission Work. That I’ve done as have some of you reading this. Then there were the incomprehensible Ascension Process years that became decades in this life and how I, how you, how we survived that phase of this AP Work is almost unimaginable to me at this point even though I lived it as a “First Wave” Elder Forerunner. Even this memory is fading today, which is probably a blessing as it was beyond horrendous in every way. After all that we entered the second phase let’s call it of the AP which has been about anchoring in the NEW higher Light Codes/blueprints/templates for the next Great Evolutionary Cycle while we simultaneously took out the trash of the dying past one. Makes my head swim just thinking about it all again now. I’ve watched and waited for that magical, mystical, mysterious long-awaited point where I was acutely consciously aware that I had reached the halfway point within all this. Where I was aware that “life” and “reality” was still half filled with old negative TD patriarchal leftovers, and half filled with brand NEW higher Light and Light Coded “life and “reality” of the NEW Earth and NEW me. This halfway point was reached around 2012. Since then it’s been a continuous quickening of moving into and through and embodying more and more NEW while casting off more and more old lower everything. Said another way, it’s been an ongoing and speeding up process of living the Separation of Worlds & Timelines since the start of 2013, and now in 2017, there’s so much separation space between me in the higher NEW location and being that the old lower negative world and reality is nothing more than a repulsive bad memory of having lived in the Dark Ages under Dark tyrants for many Ages.